For a variety of reasons, fifth-wheel trailers have become enormously popular. 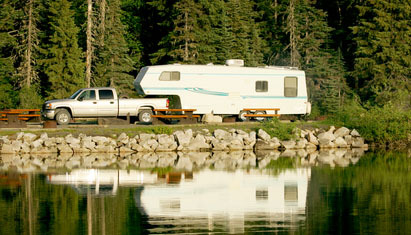 The principal advantage of a fifth-wheel is extra-stable towing due to the geometry of the hitch location and design. It’s almost possible to forget a truck is towing a fifth-wheel because fivers track straight and true and display virtually none of the swaying tendencies that can plague certain travel trailers under some circumstances. Functionally, a fifth-wheel is much like a travel trailer except that its floorplan always includes some accommodation for the raised area up near the gooseneck. This area is normally used for the bedroom and bathroom, and these spaces aren’t functionally affected by the slightly lower headroom up front since that headroom is still taller than the average RVer. The main drawback to a fifth-wheel is the way the hitch occupies space in the bed, and precludes the use of a truck bed for extra storage. However, there are a variety of bed-mounted toolbox options that work around the hitch to help users take advantage of the available storage space.